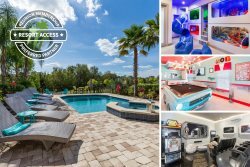 Located just minutes from Orlando's theme parks, shopping, dining and other area attractions, this luxury villa is located in Solterra Resort. Solterra resort is just a 5 minute (2.5-mile) drive from a Publix supermarket and other stores. There is also an IMAX movie theater and many other stores such as Target located at Posner Park, just a 7 minute (4.2-mile) drive away. Enjoy unlimited access to all the resort has plenty to offer with a state of the art clubhouse, resort pool, hot tub, well-equipped fitness room, lazy river, tennis and volleyball courts, children's playground and recreational area. There is also a poolside cafe where you can enjoy food and drinks such as frozen cocktails! Please Note - Construction of new homes is taking place in the resort, further down the street from this home. Homes in the immediate area as this one are complete so there should not be any disruption to your enjoyment of the home. This is no ordinary 11 bedroom villa, this one of a kind villa was originally the 14 bed Monticello floor plan, that has been customized to become the ultimate 11 bedroom vacation space. No other home in the resort compares to the upgrades this home has. *Please note, some of the bedrooms in this home are designed to accommodate children, it does not accommodate 24 adults. This home sleeps 16 adults, the rest are bedrooms designed for children 16 and under. The great room features a large 75-inch wall-mounted LED TV that includes access to a Netflix account. Perfect for an evening movie, a 150-inch motorized projector screen comes down in front of the TV. The kitchen has stainless steel appliances including two fridge freezers and two dishwashers. The stunning oversized quartz countertop island has 5 bar stools. The enormous 60 ft x 47 ft pool deck and screen enclosure have been extended both in width and depth to give the largest outdoor living space in the resort. Enjoy 2,820 sq.ft of outdoor space on top of the 6,828 ft under A/C to give a total of 9,648 sq.ft. for your family or group to spread out and enjoy your time in Florida! There is an outside shower and poolside bathroom with walk-in shower. Compete with your family or friends with fun games such as table tennis, corn hole, and a poolside basketball hoop. The upgraded large pool (approximately 15 ft x 30 ft) features a spillover spa, water feature & deck jets. Outside you will find a large tiki bar with BBQ grill, fridge and TV. Enjoy some shade on the lanai with table and seating for 12 as well as 10 sun loungers to soak up the Florida sun. The downstairs movie room seats 17 people, it has 12 commercial movie seats, plus a 13 ft counter top bar with 5 bar additional stools where you can enjoy watching movies or sports. The adjoining arcade area features a Batman arcade machine, skeeball, and basketball arcades. The massive 747 sq.ft. upstairs games room den has upgraded extra large windows overlooking the preserve behind the home. This is the ultimate entertaining space and includes a wet bar. There is a wall-mounted 75-inch 4K LED Smart TV and huge 4 player Pac-Man Battle Royale arcade. Plus an amazing collectors edition 1965 Shelby GT350 pool table. Downstairs there are two Master suites (Navy & Sea Foam) that have King size beds with 55" Curved TV's, walk-in closets and an en-suite with twin sinks and upgraded walk-in showers with edgeless glass doors. There's also another "Champagne Gold" King Master bedroom upstairs too with the same features. Downstairs, the largest bedroom in the house has been reserved for children featuring two (Twin/Twin) custom built bunk beds in an amazing Space themed room with fiber optic lights in the ceiling. There is a 43" smart TV connected to a pedestal arcade. Kids will love the Super Hero HQ bedroom with a Full over Full bunk bed and large projector screen that has access to a secret playroom with a slide, foam pit, monkey bars and Minion wacker arcade! The playroom has two 43" Smart TV's connected to two games consoles. There is also an amazing custom built princess castle bedroom with Full/Full bunk bed and 43" Smart TV. Lastly this home includes a downstairs gym with en-suite bathroom for you to burn off all those fantastic meals you're enjoying while on vacation. Please note, some of the bedrooms in this home are designed to accommodate children, it does not accommodate 24 adults. This home sleeps 16 adults, the rest are bedrooms for designed for children 16 and under. All bedrooms were beautiful and very clean - outdoor living was important to our family and we rate the pool / grill area a 10!! This home was our favorite rental - we have used reunion 3 times and this home was excellent!! The house was impeccable! The service and easy check in and check out was something everyone should use. The decor was out of this world. A beautiful place to stay. Highly recommended!! Beautiful place! Lots of amazing things to do - you never have to leave!! And you wouldnt want too! The property was far beyond what we expected!! It was amazing and we were speechless! The cleanliness, the amenities, the decor was beautiful and security was astounding. Easy, fast and welcoming!! I booked last minute its and they handled it like I booked a month in advance. Very accommodating. Every property management team member was so helpful and always wanting to make you happy!! We are already planning on returning!